Artiss YouTube Embed: The YouTube ID of zWVIXPi01vY is invalid. When Catillo Dayana Nunez and her husband, Alvin, discovered that their daughter, Angie, had Osteogenesis Imperfecta, did their best to educate themselves about the genetic disease. They found that in Panama, knowledge was limited. 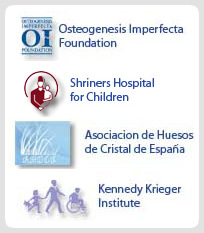 They said that in Panama there were only one or two cases of Osteogenesis Imperfecta, the HI. He said there was nothing they could do to improve the quality of life for Angie, but gave up. Dayana found other families affected by OI and found that they too were having trouble getting answers from doctors about OI. She wanted to help all those children to receive all the help you need. Finding Help, Anibal Miranda met the lawyer, who offered some guidance. "It was like a guardian angel,"Dayana account. "He told me that because we organized as parents of children with OI, and that's when the process began to create the Crystal Children Foundation. " The foundation was established legally in the 2007, and now helps 57 There are cases of people with OI reported in Panama, and continue looking for more cases. "We realize how important it is to inform the community," said Dayana. "Not only the general public, but teachers, Doctors, parents, and every one of those one way or another relate to these children so that they know about the situation of these children and how to handle, and why there is this foundation in order to be supported by them. " Dayana has developed with each of the families working with the founding of a close relationship. "I want these children to change their lives and a better quality of life,"Says Dayana. "Maybe this afternoon to help an adult with OI, but there are babies of months time to go to school without using a wheelchair, standard and live;. I think if the organization does not exist, these families did not have any help. " "Every parent that comes to foundation, we give a kind of guidance as to what to do to give their children a better quality of life. Everything improves when parents are given guidance as well as the children only go to a doctor to monitor all,and receive better care. " Since the Foundation began the Crystal Children, Dayana has worked closely with the medical community that can bring treatment to Panama. On a visit to the Hospital del Niño in Panama City, Dayana Mejia met Dr. He said that if he found more cases, to please tell you to join and could work together to find a better treatment for OI. The employment of Dayana and Dr. Mejia has become increasingly stronger, and so, more and more children are being treated better. Similarly, needs to be done. "Without this foundation, these children had had a very dark future,"Says Dr Mejia.